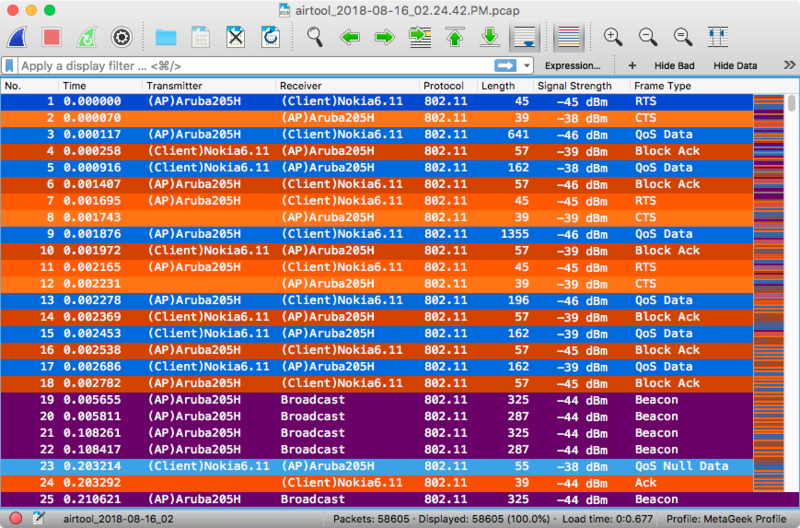 I love Wireshark, but one thing is for sure: tracking 802.11 conversations with my human brain is difficult. Coloring rules help, but I find it very difficult to remember which MAC address is which wireless station. 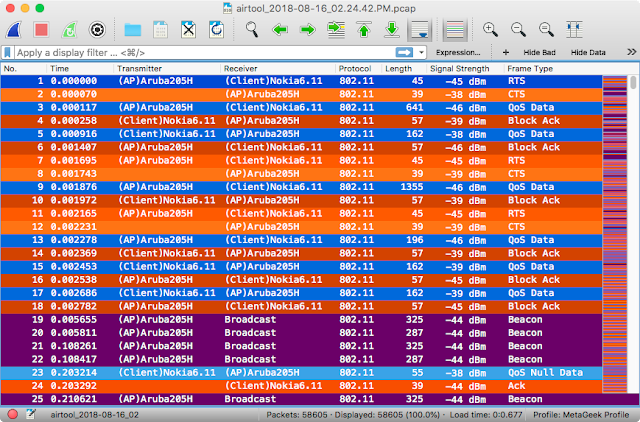 Fortunately, Wireshark has the ability to alias IP and MAC addresses! These are defined in the "ethers" file. You should be able to do nearly the same thing on Windows, but here's how to do it on macOS. 2. Define the MAC address and the desired alias in the file. Separate the MAC and alias with any number of spaces. Aliases themselves can't contain spaces. Tip: I like to lead with either (AP) or (Client) so I can immediately tell which side is talking. 3. Save the file by pressing Ctrl+X, then Y for yes, then Enter. 4. 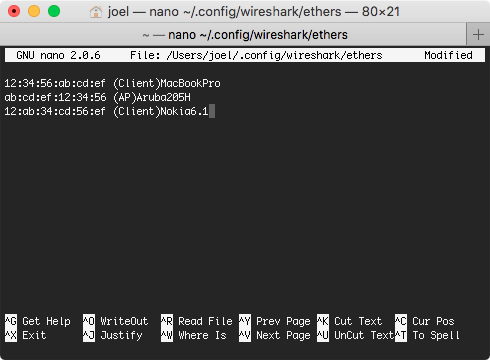 Restart Wireshark, and now friendly, readable aliases will appear in place of MAC addresses. You can quickly add new MAC addresses to your file with cat. Warning: Don't use just one ">", if you do, cat will overwrite the entire file, so don't mess that up. 2. Press Enter, which will start a new line. Add any new hosts, line by line. 3. Press ctrl + d to write the additions to the file. 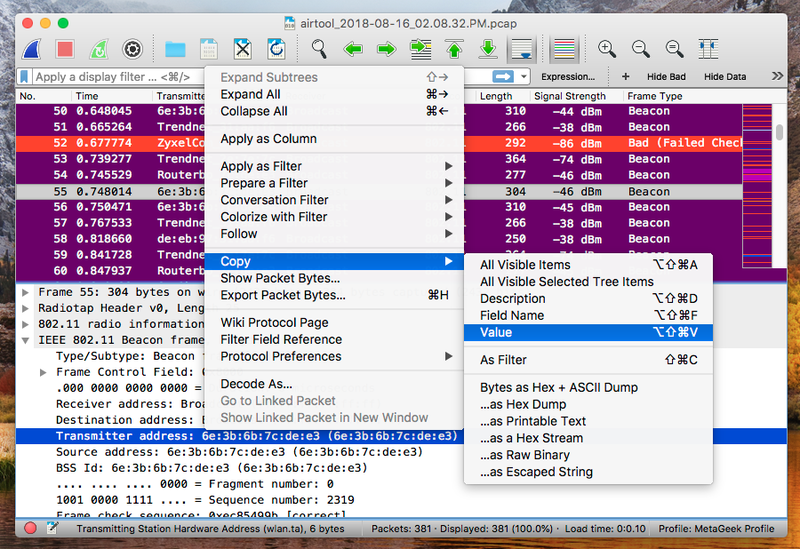 It's fast and easy to copy MAC addresses out of Wireshark, and you can paste them into the terminal. 1. Find the transmitter, receiver, source, or destination frame in the Packet Details pane, and right-click it. 2. Select Copy > Value to copy out the MAC. 3. 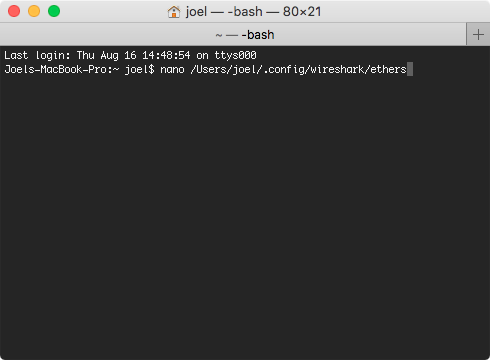 Paste into the terminal with command + v.